When we think about staying healthy as we age, lung health and deep breathing isn’t often the first thing that comes to mind. Ovation Communities’ Director of Research Dr. Christine Kovach and her team, along with pulmonologist Dr. Bud Margolis, recently conducted a research study to uncover just how important deep breathing is in older adults, and how much restrictive breathing can impact other aspects of our lives. The study showed that a high percentage of resident participants had a restrictive, shallow breathing pattern. The Ovation research team was the first to discover that restrictive breathing is a major issue in senior homes, and likely a problem for most older adults. Dr. Kovach notes that these findings are significant because people with restrictive breathing are more likely to develop pneumonia, and more importantly, shallow breathing decreases the amount of oxygen available for walking and performing daily activities. The research brings new attention to the problem, and has also provided essential information for developing therapies to help residents breathe deeper and in turn, improve their overall health. “We’re excited about our findings because through simple therapies, there is potential to prevent lower respiratory infections, improve physical function, and ultimately improve our residents’ quality of life,” said Dr. Kovach. 1. Increase strength. 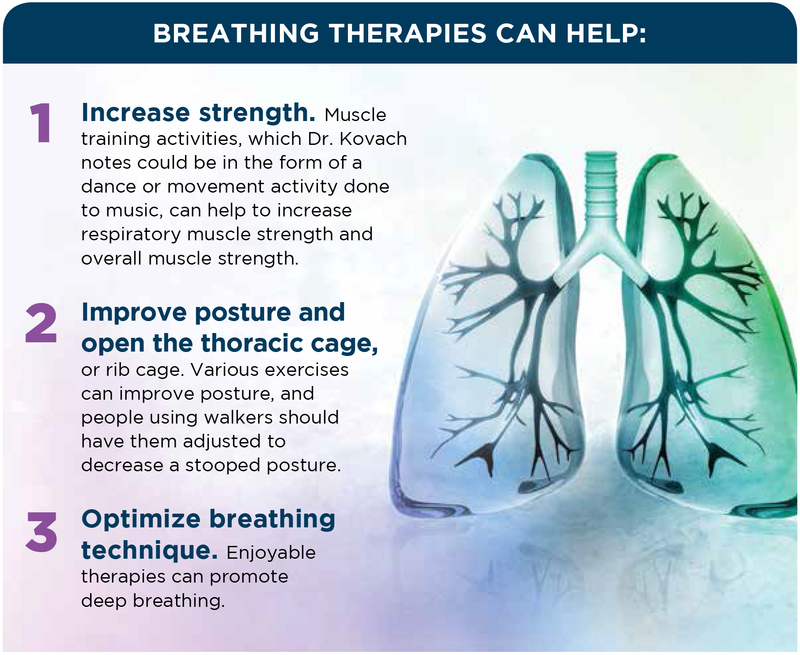 Muscle training activities, which Dr. Kovach notes could be in the form of a dance or movement activity done to music, can help to increase respiratory muscle strength and overall muscle strength. 2. Improve posture and open the thoracic cage, or rib cage. Various exercises can improve posture, and people using walkers should have them adjusted to decrease a stooped posture. 3. Optimize breathing technique. Enjoyable therapies can promote deep breathing. If research is an area you’re interested in supporting and would like to learn more, please contact Tanya Mazor-Posner, Vice President of Development, at 414-721-9260.